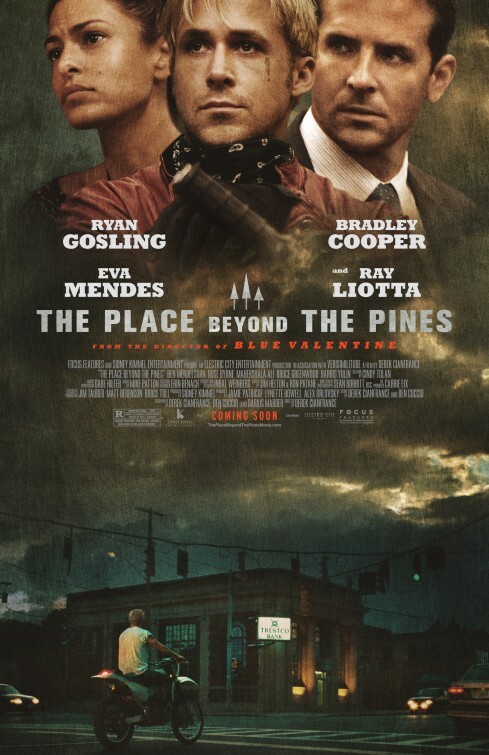 The film that almost instantly springs to mind when watching The Place Beyond the Pines is Drive. Ryan Gosling stars in both, and in both he plays an outsider, a semi-vagrant. The Driver is a suave customer on the surface; he steers people away from danger in his glossy 1973 Malibu. Luke Glanton, on the other hand, trundles towards peril atop a motorcycle, common sense not in tow. For him it’s either a spherical cage of imminent perpetual risk or a bank robbery. Unlike Drive, Derek Cianfrance’s ambitious picture widens its berth to include a host of other characters. The result is an end product that is nowhere near as chiselled as the 2011 indie, at times detrimentally so, but one that should absolutely be applauded for its scope. Luke Glanton (Ryan Gosling) is a stunt motorcyclist who travels from state fair to state fair earning a wage. Upon rekindling his relationship with a previous beau, Romina (Eva Mendes), the marauder ventures into a life of crime. That’s where he encounters Avery Cross (Bradley Cooper), a police officer whose moral head space is struggling under the weight of a corrupt department. Primarily, this is the story of two people and the incessant reverberations of their actions. We meet Luke from the off, and follow him as he strolls into a bowl of hell. His job, as a stunt motorcyclist, perfectly embodies his unconventional lifestyle. The quiet, edgy nomad is someone for hire and when we first meet Luke his already dirty attire fields smatterings of blood. Instantly we feel detached, yet the revelation that he has a son enshrouds our lead with some semblance of humanity. A church scene that pits a worn out Luke as a self-realised squanderer is powerful. The constant circle of danger that flares throughout the film — the cage, his annually reloading lifestyle — succumbs to a strive for rehabilitation. Director Derek Cianfrance then violently cuts from intense, loud robberies to sweet family days out. It works. The desperation in Luke becomes apparent; here is a character whom we’re not necessarily encouraged to get behind, nor is he somebody tarred with pitch black strokes. His criminal exploits are stark but they’re not isolated, a notion that vividly rears during a home altercation. As he, Romina — Eva Mendes is an amiable foil for Gosling, but her character suffers from a lack of clear definition — and their child are having a family photo taken, Luke relays his instructions to the taker: “Just capture the mood… the bike’s part of the family.” It is one of his few moments of solemn happiness. On the surface, Avery Cross is different animal. He is a do-gooder, a fresh faced police officer. Avery spends his days protecting people from the likes of Luke Glanton. However, the reverberations of an incident leave him shaken, more or less infecting Avery with the same ceaseless moral dilemma prominent in the mind of his criminal counterpart. Work also becomes his escape, and his workplace is one wrought with wrongfulness too. (“But that’s the job” is a phrase of resignation constantly thrown around). This is where the film runs into its first problem. Avery is part of a crooked police department led by the viciously enrapturing Ray Liotta, but we don’t really believe it. Is the whole division corrupt? The virtuous cop’s aversion to corruption paints him with a gloss of goodness but we’re left to ponder why he is the only impartial officer. This is the first in a chain of coincidence that ends with a major bang, though by then we’re willing to forgive. Whereas the corruption layer is a similarly fortuitous addition installed by Cianfrance and co-writers Ben Coccio and Darius Marder, it is one that rings less true, less authentic than the rest. In a sense, the director’s ambition suffers a tad as it becomes warped by sheer scope, but it shouldn’t be shot down as a result. Somewhere approaching the midpoint, the director unleashes quite the narrative swerve. The sequence is unexpected but ultimately rewarded because it endeavours to further the story, adding depth in the process. Regardless, the move signals the inception of a stunningly constructed piece of cinema. Ryan Gosling’s work as Luke might be his best to date. The star manages to balance a controlled ferocity originating from struggle and toil, with a slice of unorthodox compassion. The Place Beyond the Pines does occasionally resemble Drive — a film whose slickness helped to paper over any cracks, a luxury not afforded here — but it is more rugged, and by proxy so is Gosling’s portrayal of Luke. As Avery, Bradley Cooper contributes with equal effort. It is true that his character follows a more recognisable and perhaps, therefore, more relatable path, but Cooper ensures there’s nothing generic about the police officer; in fact the further along we go, the meatier his role gets. Dane DeHaan’s performance is another worth singling out for praise, his stock on a seemingly unending rise. Other factors are complimentary too. For instance, we get the raspy echoes of Bruce Springsteen rather than the melancholic waves of Kavinsky. At these points the outing hints at Scoot Cooper’s Out of the Furnace, a sentiment that gains more weight in tandem with Sean Bobbitt’s crackling cinematography. The camera stalks characters, firmly placing us amongst the people on display and invoking another degree of personableness. It’s guerrilla filmmaking finely executed. Derek Cianfrance’s follow-up to his uncompromising hit Blue Valentine retains the same empathetic tendencies as said flick, but ambitiously rolls them out over a vaster blanket. The story presents two sides of the same coin, both engaging and effective. There are dips conjured by happenstance, but nothing catastrophic. Rather, we’re attracted to Cianfrance’s portrait of life, work, consequence and connection, and it’s a well-founded attraction.